So here’s what’s known in this outright strange and surreal situation. 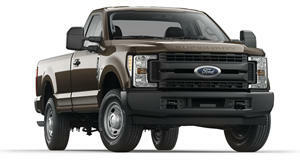 A guy named Jeff Oberholtzer, a plumber from Texas City traded in his Ford F-250 work truck for a new one in 2013. As is the case with trade-ins, the truck went to auction with Oberholtzer’s business name and phone number still displayed on the doors. No one bothered to remove the info. And, for reasons that probably will never be able to be explained due to the nature of vehicular auctions, that F-250 is now in Syria. It’s being used for combat in the bloody civil war and its new "owners" are members of the Islamic-extremist rebel group Ansar al-Deen. Just this past week a photo of the truck showed up on Twitter. It’s clearly not being used for a plumbing business anymore, but Mark-1 Plumbing’s name and phone number are still on the door Since the Twitter release, Oberholtzer and others who work at Mark-1 have been receiving death threats from idiots who actually think this small plumbing business is involved in terrorism. Youtube news channel TomoNews US followed with this report.